Having a dry creek bed, or swale, is critical to sustaining a healthy, beautiful landscape you can take pride in. Not only does a dry creek bed ensure proper drainage, directing water away from your home and hardscapes, but it’s also an important part of erosion control. And a swale does more than improve the functionality of your landscape design—it can also enhance the aesthetic of your property! At O’Grady’s Landscape, we can help you make the most of a dry creek bed with cobbles for a natural look or the perfect design to create a sense of direction. Whatever your needs may be, we have you covered. Let us help you improve the drainage and design of your landscape in Northern Virginia. Call us today at 703-533-5001 to schedule a consultation for swales and dry creek beds in North Arlington, Great Falls, the City of Falls Church, McLean, or Vienna! A dry creek bed, or swale, is a drainage system designed to redirect surface water away from your home and hardscapes. It’s typically composed of a ditch, drainage rock, and filter fabric that work together to reduce erosion control. The rock specifically prevents the ditch from caving in to maximize the lifespan of the swale, while the filter fabric prevents soil migration. At O’Grady’s Landscape, we can help you choose best location for dry creek bed installations so that any heavy rainfall is properly redirected; typically we recommend this type of drainage solution in landscapes where water runs down hills towards the house. A dry creek bed is designed with the primary purpose of improving landscape drainage. But with the right layout and combination of materials, it can also enhance the look of your landscape, even serving as the focal point to your backyard gardens. At O’Grady’s Landscape, we can help you choose the rock type that works best for your property, according to your preference for size, aesthetics, and price. We recommend a mix of natural boulders, river rocks, and plantings for a natural yet artistic look. 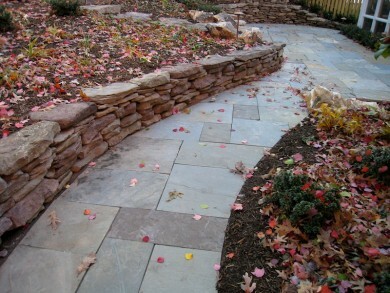 We can also include stepping stones to create a natural pathway. Improper drainage can lead to extensive damage, ruining the hardscapes and plantings you love. But with the right system installed you can avoid some major headaches—and we’ve got just the solution for you! Our landscapers can help you install a swale or dry creek bed that can redirect water runoff safely and effectively away from your property while adding to the aesthetic of your landscape. Let us help you accomplish your style and drainage goals at once with a swale in Great Falls, McLean, Vienna, North Arlington, or the City of Falls Church. Call us at 703-533-5001 to schedule a consultation today!